← ويلٌ للعرب Aug 3 Posted by Politirature . ★ Limited but violent clashes took place between activists and a pro-Mubarak group of about fifty persons outside the exceptional courtroom in the Police Academy. ★ They took Mubarak on a medically equipped helicopter from Sharm El Sheikh hospital in Sinai to the courtroom in Cairo. ★ Only a limited number of the lawyers of the prosecution (our guys) were allowed into the courtroom, on other hand, almost all defense attorneys (Mubarak guys) were allowed in. ★ The judge Ahmed Refaat is well known and said to be clean but a close friend of mine lives in his building told me that he was a close friend of Mubarak and they used to play Squash (Mubarak’s favorite game) together. ★ Someone announced that the defendants are coming in, the courtroom murmured and like movies, the judge silenced everyone. ★ Habib Al-Adly made his way to the cage first, followed by other defendants and the two sons of the former president Alaa & Jamal, and Mubarak. ★ Mubarak entered the cage on a hospital bed. ★ All the defendants were wearing white prison suits but Al-Adly came in blue because he was convicted in another case. ★ The judge reminded everyone with the courtroom rules and he made sure that all defense attorneys are present. ★ All the lawyers began to tell the judge their notes and demands, those of Mubarak took the whole time and the judge was very nervous and unable to control the courtroom, the atmosphere became very tense. ★ Farid El-Deeb, the famous lawyer and his dream team were defending Mubarak and Al-Adly while most of the lawyers of the prosecution were unkown, camera slaves and the event was bigger than them. ★ Farid El-Deeb said he wants to bring 1600 witnesses to court. ★ A weird lawyer told the judge that Mubarak died in 2004 and the one in the cage is a fake one planted by Israel and USA to keep the conspiracy going, and he asked for a DNA test. ★ After the fight on the microphone between lawyers was over, Public prosecutor read out the accusations against Mubarak, his two sons & his minister of interior including ordering and managing the attacks by Egyptian Police on peaceful protesters and supplying weapons, live amunition & armoured vehicles for the attacks. He also listed the billions of Egyptian pounds that were stolen by Mubarak, his two sons and the billionaire Hussein Salem. ★ Mubarak and his two sons denied all charges. 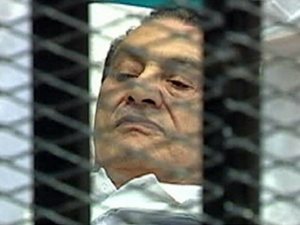 ★ The Judge decided that Mubarak stays in The International Medical Center on Cairo-Ismaillia road and said that the second session to be held on August the 15th with his two sons. ★ Habib Al-Adly Session #2 to be held tomorrow at 9:00 am CLT.